What Day Of The Week Is December 7? 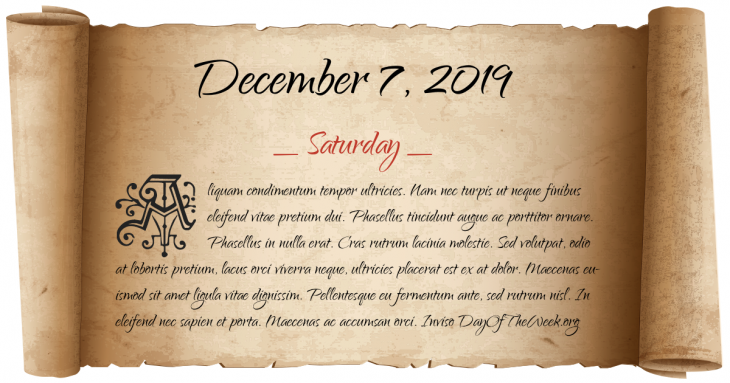 December 7, 2019 is the 341st day of the year 2019 in the Gregorian calendar. There are 24 days remaining until the end of the year. The day of the week is Saturday. World War II: Attack on Pearl Harbor – The Imperial Japanese Navy attacks the United States Pacific Fleet and its defending Army Air Forces and Marine air forces at Pearl Harbor, Hawaii, causing a declaration of war upon Japan by the United States. Japan also invades Malaya, Thailand, Hong Kong and the Philippines at the same time (December 8 in Asia). Instant replay makes its debut during an Army–Navy game. Pope Paul VI and Patriarch Athenagoras simultaneously revoke mutual excommunications that had been in place since 1054. In Texas, Charles Brooks, Jr. becomes the first person to be executed by lethal injection in the United States. Spitak Earthquake: In Armenia an earthquake measuring 6.9 on the Richter scale kills nearly 25,000, injures 15,000 and leaves 400,000 homeless. Norfolk Southern ends its steam excursion program. This is the last time that Norfolk and Western 611 is under steam. Ante Gotovina, a Croatian army general accused of war crimes, is captured in the Playa de las Américas, Tenerife by the Spanish police. Who were born on December 7?